(Sorry, totally forgot to post this yesterday! ;-) TGIF!!! So happy for the weekend and the warm, beautiful forecast in store! 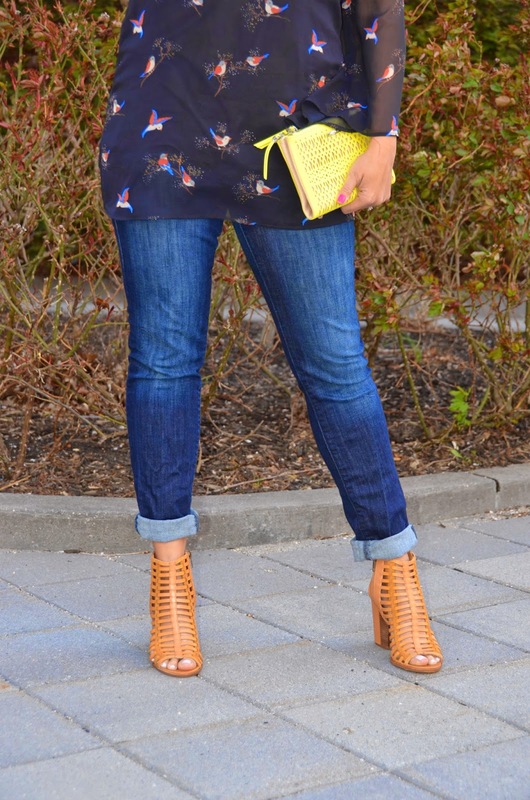 This outfit is a perfect casual chic look for the weekend or a date night look. This past week temperatures were cooler, so I put on this long sleeve top that I got at Goldy and Mac boutique in the town of Greenport out on the North Shore of Long Island, NY (one of my favorite stores out there). I love it because it's lightweight, and has long bell sleeves, so it's good for a spring look, but keeps me warmer in the cooler temperatures. This top would look great with a tight skirt too, but in keeping it casual, I paired it with jeans, my favorite caged heels, and some fun Stella & Dot accessories. Can't wait to enjoy some time at the beach this weekend! What are all you jet setters doing this weekend?